If you’re a prospective MBA student who applied in Round Two, you’re probably walking around with your phone attached to your hip. You’re waiting on that call or email from MBA admissions officers informing you of your business school admission decision. Relax. Put the phone down. The stress isn’t helping matters. Enjoy the long President’s Day Weekend and try to think about something other than your MBA admissions decision. After all, you’re driving your co-workers and family nuts. If you’re an MBA applicant in Round Two, enjoy the weekend. Put your phone down and stop stressing. Your admissions decision will arrive shortly. It’s not coming on Saturday (photo credit: HBS1908). Round Two admission decisions will be coming out now through March. Many applicants have already interviewed for Round Two. Others still have some interviews to go. At highly selective MBA programs, if you get an interview, you’ve got a decent shot of getting in. That doesn’t mean you can blow the interview. You’ve got to really stand out there. But it’s not like in college admissions where every applicant often gets the chance to interview with an alum — regardless of their standing in the admissions pool. Indeed, most highly selective MBA programs interview 1/3rd of applicants. At Cornell’s MBA program as an example, about half of those interviewed end up receiving offers (side note: for Cornell applicants, your decision will be released via a phone call on 2/28). If you happen to get waitlisted, as many MBA applicants do, does that mean that you should do nothing and just wait around and hope you get in? Absolutely not! When you’re waitlisted, you’ve got to work to get off that waitlist. You’ve got to show interest. You’ve got to speak to professors, admissions officers, current students. You’ve got to write a letter of enthusiasm to demonstrate your passion for the MBA program (and offer insight into what you can bring to it). But don’t worry about getting waitlisted for now. Now is the time to ditch your cell phone and enjoy the weekend. Seriously! 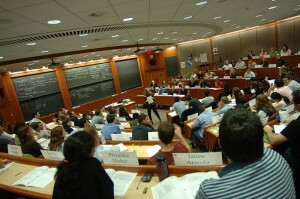 While you’re here, check out this post on Business School Admissions.